Last year for Christmas, the mister presented me with a sweater, and a bottle of Clear Creek Pear Brandy. It was not unexpected. The same gift is exchanged every year. We both pick out a sweater, something nice, and a bottle of the drink. He had, however confused the Pear Brandy, with Pear Edu de Vie, a liqueur I had been raving about all fall. I didn’t really know what to do with the pear brandy, it isn’t something you just add soda water to and kick back. It is strong, very strong, with a bouquet of Bartlett pears that sends you straight into a boozy pear orchard with one whiff. I’ve used some in baking, great, and tried sipping it straight, pretty good, but found the brandy really sings when dressing up a flute of sparkling wine. 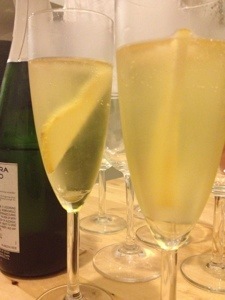 I tested this recipe several times and found a few things to note: watch that your sparkling wine isn’t too sweet. If it is, the honey syrup will be overkill. Also, have a light hand with the brandy, a little goes a long, long, long way. I’ve included two variations of the recipe. A single serving, and a mix for 8. Ideally, I’d serve this as my guests are arriving to the holiday soirée, and switch to wine for the rest of the evening. 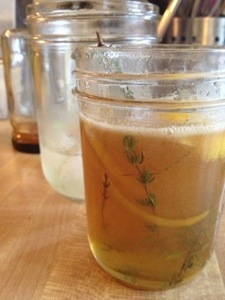 Add the brandy and honey-thyme syrup to a flute glass. Top with Sparkling wine and drop in a thin slice of pear for garnish. In a small bowl, mix the brandy and honey thyme syrup together. Evenly distribute between 8 flutes. Top off with sparkling wine and garnish with pear slices. Combine the honey and water in a small sauce pot over medium high heat. Bring to a boil, and remove from heat. Add the lemon peel and thyme sprigs. Let the aromatics steep until the mixture is at room temperature. Store sealed, in the refrigerator for a week or so.